Last week The Porcupine’s Quill set out for the little city between Ottawa and Toronto to take part in the Kingston WritersFest. It all started several months ago when Tim slyly suggested I should contact KWF about launching The Essential Tom Marshall in their 2012 festival. It only took a little persuasion of the KWF team to secure a spot on the programme, as Tom was a prominent Kingston poet, writer, publisher, and professor. As I reached out to other prominent Kingstonians seeking their support for the event, I found most of them (all of them) had been Tom’s friends. Many in Kingston still remember the late poet. They remember the excitement they felt when he published that first collection of poetry with Tom Eadie and Colin Norman in 1965; they remember the raging parties he used to throw at his Victoria Street home whenever an author came to town for a reading; they remember the ghostly walks he used to take through the park, down to Kingston’s old quarter, bent against the wind from the river…. Tom Marshall died young, in his fifties, in 1993, but at the launch of his essential collection of poetry last Friday I found that his memory is still very fresh in Kingston. 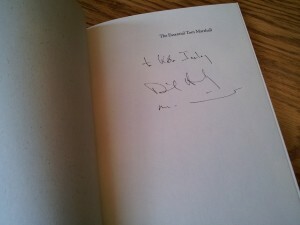 The Essential Tom Marshall on display at the 2012 Kingston WritersFest. The launch of The Essential Tom Marshall started late. As we piled into Bellevue South on the top floor of Kingston’s Holiday Inn, we were told there were not enough chairs. The event, it appeared, had more attendees then originally supposed. I sat at the back of the room, watching as chairs were brought in, one after another, balanced precariously over the heads of the crowd. The room was filled to the brim, at least a few hundred in the audience. A photo of Tom Marshall, taken from his youth, sat on an easel on stage. The readers arrived: Michael Ondaatje, David Helwig, Steven Heighton, Diane Schoemperlen, Carolyn Smart, Eric Folsom. Entering together in one long line, they took their seats at the front of the room. Michael Ondaatje in a lose-fitting coat; Steven Heighton in a black leather jacket; Diane Schoemperlen in little red boots. All of them prominent Kingstonians at one time or another, all of them old friends of Tom. 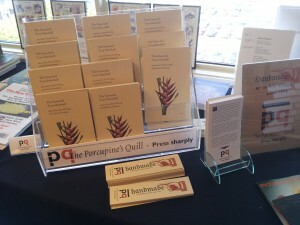 Michael Ondaatje and David Helwig edited this collection for the Porcupine’s Quill in the hopes of bringing Tom back as a living voice. I am pleased to say, that is exactly what was accomplished on Friday night. Once the event was underway (all the patrons sat comfortably in their chairs), the launch progressed casually, as a gathering of old acquaintances sharing stories of the poet, their friend, Tom Marshall. Michael Ondaatje began the readings. He told us first of the excitement of those early days when Tom published a first, joint collection of poetry, The Beast with Three Backs, with Tom Eadie and Colin Norman. How envious they all were, Ondaatje said, of that title. Ondaatje was followed by Steven Heighton. Heighton reminded the audience of the quiet, contemplative Marshall who could often be seen wandering around the streets of Kingston, like a ghost. Heighton read an excerpt from “Islands” to punctuate his point. Carolyn Smart read next. She told us of her friendship with Tom, which grew from the first time they met, at a party, both being the person who preferred to sit on the couch in the sidelines, watching the literary personalities collide. Smart also told us of a conversation she had with Tom much later, a conversation about love and obsessing—how Tom would become obsessed with this person or that, how he would walk to that person’s house in the night and stand outside the darkened windows, obsessing. She read “The Friends” to conjure that Tom for us. David Helwig followed Smart. He told of Tom’s parties on Victoria Street. They were always good parties, he said, but he did have one complaint about them. On one occasion Tom was throwing a party for Margaret Atwood, who had just come to town for a reading. Upon arriving at the house, Atwood had asked for something to eat, having not had time to eat beforehand. Loath to start drinking on an empty stomach, Atwood, with Helwig, had gone through Marshall’s house looking for food. When they opened the fridge they found it completely bare. Tom always had lots of liquor, Helwig told us, but never any food. When Helwig complained to Tom, Tom obliged by buying one solitary bag of chips, which he put out on the table, for the next party. 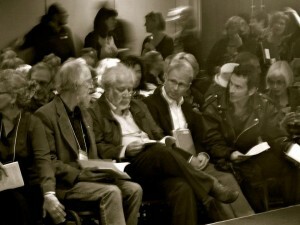 David Helwig, Michael Ondaatje, Eric Folsom, and Steven Heighton prepare for their readings at the 2012 Kingston WritersFest. Photo by Bernard Clarke. Diane Schoemperlen read after Helwig. She described for us the excitement she felt upon visiting Kingston for the first time to teach a workshop on creative writing. She was so excited, in fact, that she promptly picked up her life and moved to Kingston. Here, she said, was a chance to live with real writers and to be a real writer herself. Eric Folsom spoke last on Tom. He told us how Tom and his crowd had always seemed so untouchable to him as a young writer. But slowly, through his attendance of Tom’s parties, Eric described how he too had found a way into the company of Tom Marshall. The event ended with Michael Ondaatje’s reading of an excerpt from “Fugue for Lonny”, one of Marshall’s long poems that was, regrettably, excluded from the collection due to page limitations. As the final piece of the program, a recording was played of Tom Marshall reading his own poem, “The Lamb”. Tom’s voice filled the room, and I couldn’t help but feel it was different than I had expected it would be. It was soft, gentle. He read his words with incredible care, stressing syllables consciously, in a way that almost obfuscated them. As if his poems were made up a sounds, not words. As if the words rose from the sounds, creating meaning, but only briefly. Even in all the excitement of the day, I managed to get my book signed by editors Helwig and Ondaatje. Returning to Kingston, in many ways, was a trip down memory lane for me as well. I never met Tom Marshall myself; I attended Queen’s University much after his time. The Queen’s I knew, the English department I became a part of, was much different than that of Tom’s, Ondaatje’s, and Helwig’s…. But even so, returning to Kingston always brings back warm memories. I remember walking to class in the fall through the brightly coloured trees that line Earl Street, or making my way through the old part of town to meet my friends at the Toucan for drinks. Oddly enough, like Tom I lived on Victoria Street during my time at Queen’s. I wonder how different things would have been if I could have, like Eric Folsom, attended Tom’s parties. (If you knew about the party at Tom’s after the reading, Eric said, you were invited.) I wonder what remains of Tom in Kingston and how his life there might have—indirectly—touched mine. I will likely never know. Even so, late on Saturday night, after dinner and drinks (some devilish craft beer tasting of hot chilis) at The Brew Pub with my friends, I found myself wandering up to Victoria Street, to where Tom lived above the park. Eric Folsom had told me Tom had lived in a bungalow, with a white porch on the right-hand side of the street. One of a row of bungalows, he had said. I wandered up the street, stopping at a group of small houses. I stood outside in the dark, staring at the blank windows, wondering which one had been his. And wondering how I could get to the party inside. To find out what happens next, click here. In the meantime, reproduced here for you, as Tom Marshall wrote it and Carolyn Smart read it on Friday, is “The Friends”. It is always night, he is silent. Cold spaces of summer night. Even the house, even the flesh recedes. There is a room, windows, trees. This entry was posted in Letters from the Porcupette (the Intern's Blog) and tagged david helwig, Kingston WritersFest, Kingston WritersFest 2012, Michael Ondaatje, The Essential Tom Marshall, Tom Marshall. Bookmark the permalink. What an absolutely beautiful tribute and post. I wish I could’ve been there. I don’t even live that far away, but as it turns out, work was pressing and I was ill, too. I love reading posts like this, of events, but also particularly of fellow authors commemorating a past with another author. And yours is so well written, captures the mood well and with patience. Have you read the Al Purdy A-Frame Anthology? I was selling books at the event for that in Belleville. I love it. Also, love the poem. Mmmm. Thanks for your thoughtful comments! I have not read the Al Purdy A-Frame Anthology…. I will have to check it out.